Forget the panels: Solar-energy investments include inverters as well. Have solar-energy stocks been on your watchlist, but you've been nervous about getting burned? It's a fair thought. Over the past year, solar-power stocks haven't shined quite so brightly. 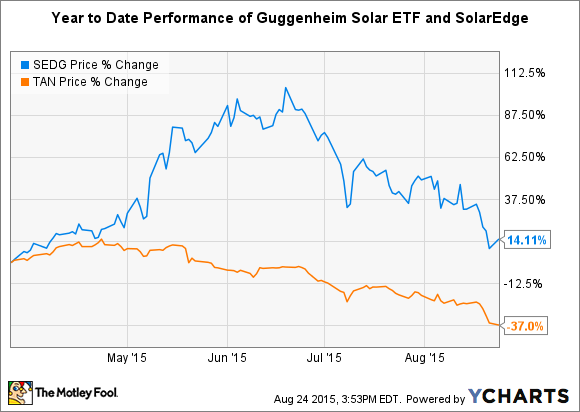 Using the solar ETF Guggenheim Solar (NYSEMKT:TAN) as a gauge, one finds that the market has punished the industry's stocks, as shares of the ETF have dropped by more than 25% in the past 12 months. On the other hand, there have been some winners. SolarEdge (NASDAQ:SEDG), a semiconductor operating in the solar industry, for example, has fared considerably better. Even though SolarEdge has only been trading as a public company for the past three months, it's still worth looking at the company and its financials to see why it has outshined the rest of the solar industry. When a solar panel receives energy from the sun, it must convert the generated electricity from AC to DC before the consumer can use it. Connecting multiple panels, string inverters, which are more prevalent, act like Christmas lights in that if the power from one panel goes out, the power from the whole string is lost. Module-level power electronics, or MLPEs, such as microinverters and power optimizers, avoid this problem, creating a system where each panel functions independently of the other. Teaming up with Vivint Solar (NYSE: VSLR), SolarEdge entered into an expanded supply agreement for its DC inverters. This is no token arrangement. Rather, it's a significant validation of SolarEdge's technology. According to Jan Newman, vice president of business development for Vivint Solar, "SolarEdge has established itself as a key inverter supplier to Vivint Solar." This comes much to the chagrin of SolarEdge's competitor, Enphase Energy, who had previously been Vivint's sole supplier of microinverters. According to GTM Research and SEIA, Vivint Solar was the second-largest installer of residential solar in 2014. Whereas string inverters have been the more common approach, MLPEs are gaining increasing traction. SolarEdge's largest customer in fiscal 2015 was the largest residential solar installer, SolarCity (NASDAQ: SCTY), which accounted for 24.6% of revenue -- a substantial increase over the 19.1% of revenue that SolarCity accounted for in FY 2014; SolarEdge's next five largest customers accounted for 29.9% of revenue in FY 2015. Although the relationship with SolarCity greatly validates the company's products, it's not without its risks. The partnership doesn't rely on a long-term supply agreement, and should SolarCity drop SolarEdge it could be devastating to the top line. One way in which the company can mitigate that risk is by finding partners who aren't PV installers -- something the company has already accomplished. Teaming up with Tesla Motors, SolarEdge is entering the power-storage space. According to SolarEdge, the home battery system, which features its inverters, offer homeowners various benefits "from serving as a backup power source in the event of an electrical outage, to maximizing self-consumption, and enabling energy independence." Whether this will evolve into a significant source of revenue for SolarEdge remains to be seen. Already, Tesla has booked 38,000 reservations. The Powerwall units are expected to be available in the fourth quarter of this year. SolarEdge's partnerships are impressive, but it's not the only thing upon which one should base an investment. Looking at the company's financial results only five months after its IPO suggests that the company's on the right track. It's not a lengthy track record, though, and investors should be reluctant to dive into a company without seeing a more robust financial track record -- but it does carry some weight. SolarEdge's fiscal year for 2015 ended on June 30. Compared with FY 2014, revenue growth for SolarEdge was impressive: a $192 million gain from FY 2014 to 2015, which translates to growth of 144%. This growth is evident in the gross profit as well, increasing 272%. And this didn't come at the reduction in margins. Quite the opposite -- the company's gross margin grew from 16.5% in FY 2014 to 25.2% in FY 2015. All of this growth worked its way to the bottom line as well. Whereas the company reported a net loss of $21.4 million in FY 2014, it reported net income of $21.1 million in FY 2015. As we turn toward the balance sheet, we find that the company is in good financial health. In part through the collecting of $131 million in proceeds from its IPO, the company increased its cash position from $11.4 million at the end of FY 2014 to $148.4 million at the end of FY 2015. Management plans on using the proceeds from the IPO primarily to help it expand into new markets. The substantial increase in its cash position is even more impressive when juxtaposed with the lack of total debt, which it reported to have at the end of this past fiscal year. Despite all the positives working in the company's favor, there are some causes for concern. For one, the company has only been trading for a few months, and time will tell if it can withstand the pressure of operating as a public company. Volatility in the renewable power market is another source of concern. The solar industry's rapid growth over the past few years is largely due to the solar Investment Tax Credit; however, the tax credit is due to expire in 2016 and its renewal is uncertain at best. Should the tax credit not be reviewed, the solar industry's growth would surely slow as would that of SolarEdge. Having closed its IPO in the spring, it has been an exciting few months for SolarEdge and its shareholders. The company's growth and execution have been impressive so far. Validating its technology, leading residential solar installers have been enthusiastic about partnering with SolarEdge. It will be interesting to see how it continues to operate under public scrutiny. Some may be willing to accept the risk and jump in now, while others may want to sit back and see how the next few quarters go. In any case, there's much more to SolarEdge that warrants a close look before any investment consideration.